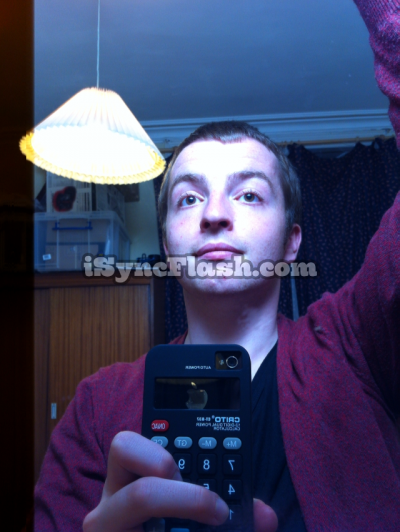 We review an iOS App that allows photographers to synchronise off-camera flashes with the iPhone's camera. And it actually works! Most people nowadays have a mobile phone. These days, many of us carry around a smartphone such as an Apple iPhone or an Android device by Samsung, HTC, LG et al. With the latest gizmos such as back-illuminated sensors and what-not, their low-light abilities are improving – though for cameraphones that might not be saying a lot. For the likes of the iPhone 4, taking pictures in dark conditions (such as indoors in the evening) is still a challenge. And anybody who has used the iPhone 4’s built-in LED “flash” will know that it’s just a little bit rubbish. There isn’t a hotshoe on the iPhone and the LED can’t trigger an optical slave. So what to do? 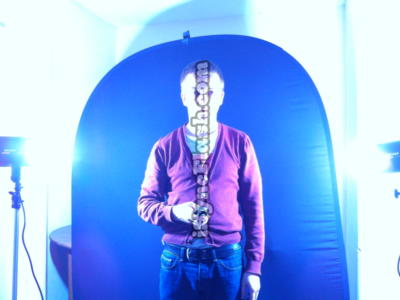 Portable LED panels are useful for videographers and are a growing section of the photographic market that could be seen to replace hot lights in the near future. 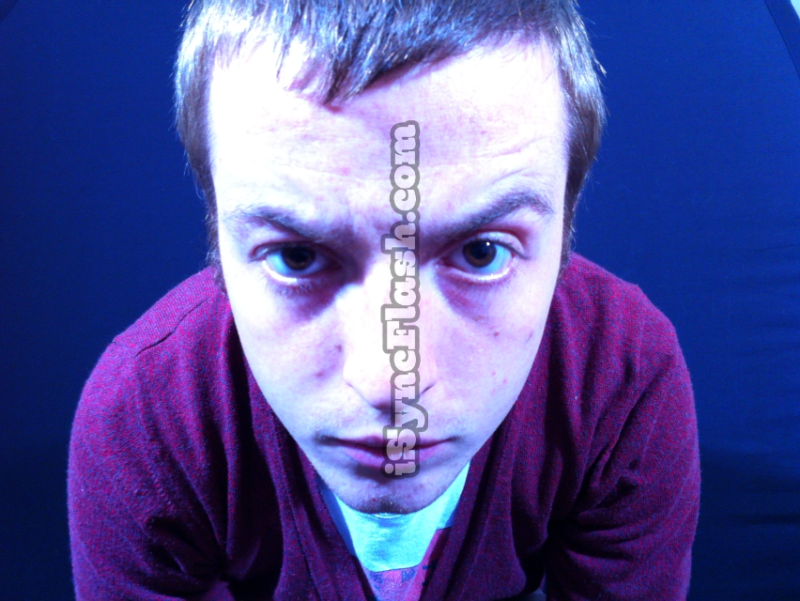 But maybe you already use flash and aren’t ready to get to grips with continuous lighting yet. Is there a way to synchronise the iPhone camera with off-camera (off-phone?) flash? Polish developer Kosmodrom released iSyncFlash towards the end of last year. 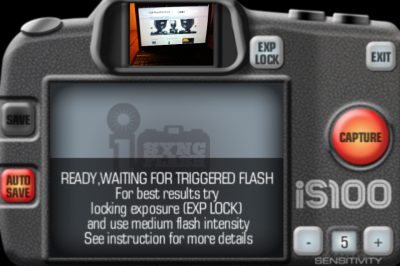 It is an app designed to allow you to use external flashes in iPhone photography. The way it works is a bit like how an optical slave trigger works. When the iPhone “sees” a flash going off, it snaps a picture. This means that the picture is ultimately captured by pressing the test button on your flashgun or radio trigger rather than any manual interaction with the iPhone touchscreen. The iSyncFlash app is clever in some ways and infuriating in others. The first thing you’ll notice is that the developers thought it would be a brilliantly clever idea to make the interface (see screenshot, above) look like the back of a DSLR. One without live view. So that huge “screen” you see is only for playback of the previous snapped picture, and you have to make do with the tiny “viewfinder” above it for composition. This also means you can’t tap to focus (but it will try to focus automatically) or switch to the front-facing camera. The rest of the buttons are fairly intuitive. The big “capture” button basically turns automatic picture-taking on or off. When it’s off, you can’t take any pictures even if you want to, because the shutter is only triggered by a flash going off. This is for if you want to stop taking pictures but keep the app open. With capture mode on, you can start taking pictures. If your phone is not in silent mode then you’ll get audible feedback each time the shutter goes. An extremely beneficial feature is the ability to adjust the sensitivity of the optical slave – i.e. how bright the flash needs to be before the app responds to it and takes a picture. The scale goes from 1 to 8, with the default setting of 5. I generally found I had to turn the sensitivity up to 6 or 7. But at 8, iSyncFlash gets a bit trigger-happy and tries to take pictures whenever it sees something move. Auto-save means the camera saves every picture it takes. If you hate having to delete duds from your camera roll, avoid this mode (especially at sensitivity 8!) and just click “save” after each shot instead. OK, so does it work? Well, yes! Firstly, where can I get an amazing iPhone case like that? Try here. Secondly, how am I supposed to handle sync speed when I don’t even know my aperture, shutter speed and Iso? Well, a bit of trial, error and science. I am told that the iPhone 4 camera has a fixed aperture of f/2.4 (other models may vary). When adjusting exposure, the iOS instead adjusts the shutter speed and/or Iso sensitivity. To lock your exposure (and white balance too), point your phone at something of the right brightness (what’s “right” is up to your judgment) and click “Exp Lock”. Once you’ve got the synchronisation correct this way (in that it produces a picture free of banding), adjust the power, position and direction of your flashgun until your pictures look nice. I found Exp Lock can be buggy at times and doesn’t lock properly, despite the button being lit up. In this instance, hit “Exit” to go to the menu, then return to the camera view and it should start working again. Alternatively, try closing and reopening the app. Pro tip: the faster you set the shutter speed (by pointing it at something really bright), the more banding you’ll get. It’s a balancing act, because if your flashes are too bright then you’ll be overexposed but if they’re too dim then you might not trip the shutter. Here’s a shot that has an exposure closer to the mark, but there’s a tiny band down the middle, possibly a result of trying to sync with two off-camera flashes at once. But then, using two 400Ws CononMark studio lights (albeit set to 1/64) is probably overkill. 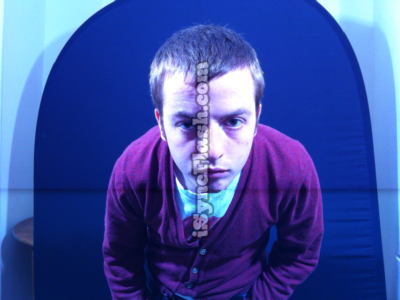 You may also notice that these sample shots all look a bit blue-ish. This is because I set my exposure by pointing the camera at a room lamp with a low colour temperature, then proceeded to use flash (which has a higher colour temperature) in my pictures. Effectively like setting my DSLR white balance to “tungsten”. So, flash photography with an iPhone is possible, works with both speedlights and monolights and is relatively easy once you get the hang of it. The resolution from iSyncFlash is 640 by 852 pixels – not the full 5MP resolution the iPhone 4 is capable of, but decent enough for web use. Moreover, if and when this app is improved upon, we could see some interesting new features. Meanwhile, your other camera can’t use apps (unless you have the Polaroid SC1630) or upload pictures via 3G. This one can! 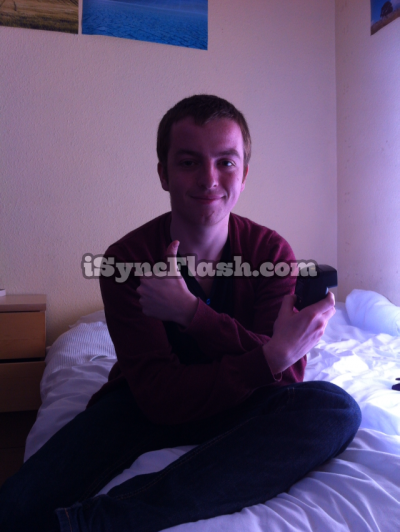 You can download iSyncFlash for free from the App Store. If you pay £1.49 (US$1.99) – an in-app purchase – then the watermarks get taken away. There is no Android version at present. Users are invited to share their photographs in the official iSyncFlash Flickr group. We’ve had an opinion poll going for a short while now about flash photography with a cameraphone and the response is far from unanimous. At the time of writing it was a fairly even split between those keen on the idea and those who were less enthused by it. If you haven’t answered yet, weigh in with your opinion below. Have you tried using this app or another like it? How does it manage on other iPhones, the iPad or iPod Touch? Share your experiences in the comments below.